Garden herbs were the gateway drug to my current edible gardening obsession. As I was in culinary school, I started landscaping with herbs rather than ordinary landscape plants so that I could have the freshest ingredients possible in my cooking. Herbs immediately captured my heart – not only because they had lovely colors & textures in the garden but also because you only had to touch the leaves as you walked by and the air was filled fragrance. But despite cooking with and constantly clipping from all those herbs, I quickly learned that I had much more than I needed. So, I dove into the world of preserving herbs. I chopped, steeped, pureed, dried and froze herbs in every way I could find. And I now have several favorite, go-to preservation options. But one of my favorites is the one method I started with (oh so many years ago): Herb Concentrates. You’ve probably read a lot about preserving herbs by freezing. The most common method is to chop the herbs and freeze them with water in ice cube trays so that you can pull them out one at a time as needed. Another popular method is to create herbal butters. And another great method is to freeze the entire herb wrapped in plastic wrap and just chop off what you need in small quantities. All of these methods work really well and I use them all at various times based on what I know I will be cooking up in the future. But for me, herb concentrates offer some advantages I can’t get with the other freezing methods. Making a concentrate is similar to making a pesto – except that there are only 2 ingredients: herbs and oil. The concentrates are stored in the freezer like the methods above. But the difference is that the herbs are not frozen in ice cube trays. Instead herb concentrates are frozen in small containers (I like to use 4 0z. canning jars). And because the herbs are suspended in oil (rather than water), you are able to use a spoon to just scrape off the quantity needed from the top rather than having to use a whole ice cube size at a time. So you can scrape off a “pinch”, a teaspoon or scoop out as much as you want. As the name suggests, they are concentrated powerhouses of flavor. You can easily use a little or a lot at a time. 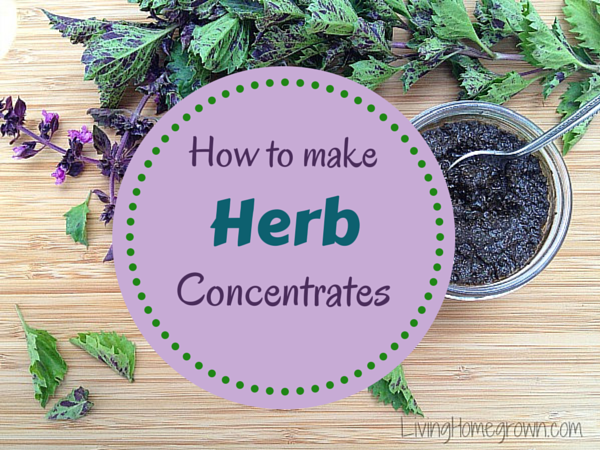 Concentrate is used exactly as you would freshly chopped herbs and in the same quantity. 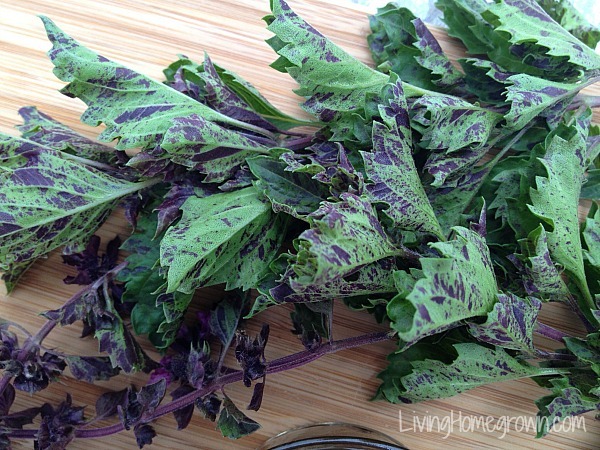 Each bit of herb is coated in oil which helps preserve it’s flavor and color. They easily last an entire year in the freezer. I know that for most of you, basil is long gone in the garden. But here in Southern California, I am harvesting the last of my basil in mass quantities. Although you can use this method with any culinary herb, basil is the a perfect candidate for your first concentrate recipe. Because basil is one of the only herbs that does not preserve well when dried. It really needs to be used fresh or it loses it potency. And I find freezing basil offers the next best thing to fresh picked flavor. For the photographs of this post, I used a new basil variety called “Ruby Frills“. It was a real show off in my garden this past year. It is supposed to have dark purple leaves with green speckles. However, mine was the opposite: green and purple mottled leaves. 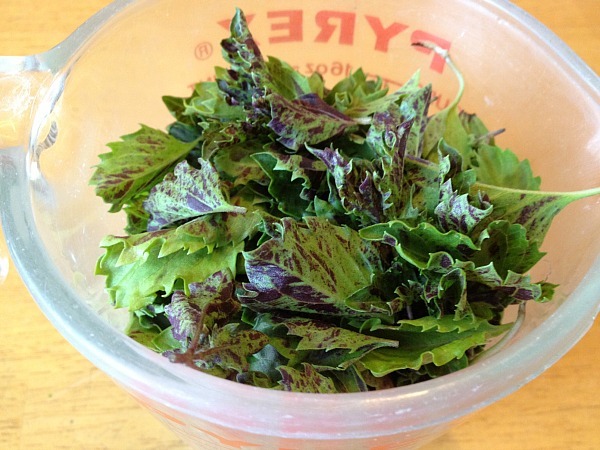 I found the leaves to be a bit tougher than standard basil, the fragrance much stronger and the flavor about the same. If you can find it in your area, try it out. It looked beautiful the whole season. When made into a concentrate it turned out dark (almost black) instead of the bright green of standard concentrate. But the flavor was killer. Herbs: Use this basic recipe with any culinary herb. You can also use edible herb flowers – especially basil. You can even combine more than one herb to create your own custom blend. 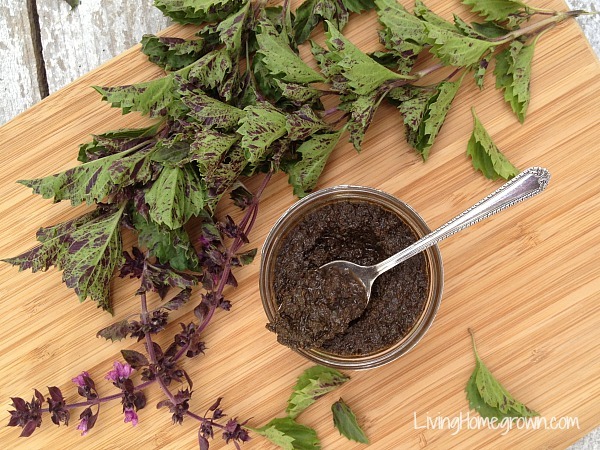 My favorite single herb concentrates are: basil, sage, mint, rosemary or lemon verbena. Measurements: The measurements here are very forgiving. You can add a bit more or less of the herb or oil and it will all turn out fine. It is more of a method than a specific recipe. The trick is to use enough oil that you have completely coated every bit of herb well. Dry Measure: It is best to make concentrates with herbs that are not damp or wet. If you have washed the herbs just before using, be sure to pat them dry as best you can. Trouble shooting: When making concentrate, it is better to have a little too much oil rather than too little. If you do not use enough oil, the concentrate becomes too hard and is difficult to scrape with a spoon later. If this happens, just defrost the concentrate for 10 minutes on the counter each time you use it. The oil quickly warms and is easier to scrape that way. Refreezing it is not a problem. Note on “hard-packed”. When measuring herbs, the leaves can have a lot of air space between them and that will alter your measurement. So, measure this recipe by filling your measuring cup and pressing the herbs down with your hand. When it reads 1 cup while pressing down, you have 1 cup “hard-packed” herbs. 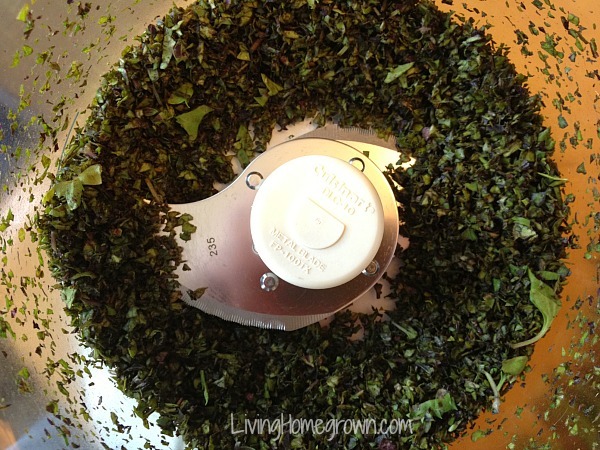 Place the herbs in a food processor. Pulse the processor until the herbs are finely chopped. (just a few pulses). Turn on the processor and with the blades running, drizzle in your oil until the herbs are very well coated. Stop the processor, scrape down the sides and stir. If you need to, repeat to add more oil until all the herbs are covered well in oil. Place the concentrate in a small container (4 oz. canning jars are usually the perfect size per batch). Label and store in the freezer for up to one year. Use in any recipe calling for fresh herbs. Pull the concentrate from the freezer and use any metal spoon to scrape the top. It should easily peel layers until you have the amount you need. 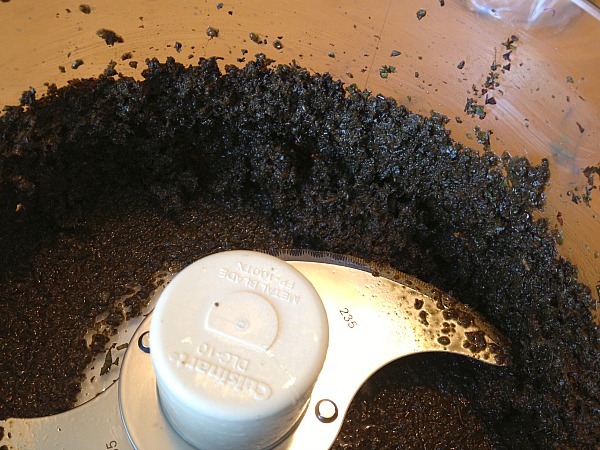 If the concentrate is too hard, set on the counter 5-10 minutes before scrapping. Use the same amount of concentrate as you would freshly chopped herbs. So 1 tsp. concentrate = 1 tsp. fresh herbs. Do you have a favorite way to preserve herbs? Please share in the comments! I’d love to know. The Ruby Frills basil looks lovely. I have used Opal basil before, is it similar? When I process green basil for storage, I blanch it first before processing with oil. This preserves the vibrant color and I can have pesto in the middle of winter. I will try freezing it in small canning jar instead of small zip bags! 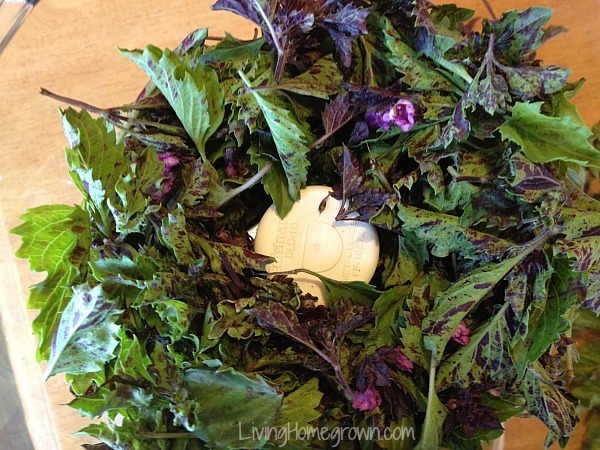 Blanching is an excellent way to keep color. Great idea. I am okay with the darker color for most of my uses of the concentrate, but if you wanted the color for something like basil potatoes or when making a spread, your method would be the way to go! I found the Ruby Frills to be stronger in flavor than the Opal basil – which is nice. It meant a little bit went a long way. Because it has a more intense fragrance too, I am betting it is just higher in essential oil than Opal. But yes, you can use it in all the same ways. I like the small glass jars because I am trying to cut back on my use of plastic. I use rings and old (used) canning lids to seal the jar. It is a great way to reuse canning lids that are no longer good for canning (because they are only supposed to be used once). Though I have gardened for many years I am just starting into the world of herbs. I froze my basil and dill this year in lumps and wondered how it’s going to work when I need to use them. I like the idea of these concentrates much better. Awesome reading for this snowy day in the central US! Sharing to FB and Pinterest! Hi Rose – Thanks so much for sharing for me! I am really happy to know you can use the info. Stay warm!! I have been doing my basil in a similar fashion, I pick, wash and allow to dry on dishtowel overnight. The next day I use softened butter to coat the basil leaves and pack into small plastic containers to freeze. An old Italian neighbor taught me this many years ago and the basil retains the fresh taste, I also make parsley and basil combinations. The oil is probably better for anyone with cholesterol concerns so I am going to try this next summer. Hi Susanne – I think the butter with basil is a great way to preserve the flavor. What a wonderful neighbor you have! This is a great post. I love basil and think this will be my new go to when I freeze it next year. I have a varied herb garden but have always stuck with a basic basil. Love trying new types of plants so I will need to find seed and grow them. Basil is one of my favorites too Donna! Theresa, I have tons of mint. What method would you use to preserve it for winter use? If you are canning them and they are sealed up, do you have to freeze? Or just keep frozen once opened? First time gardening and preserving! I don’t “can” my herb concentrate. I just either place them in the refrigerator or the freezer. You can’t “can” it for the pantry shelf because it has oil in it. It is too low acid for room temperature storage. It would spoil and could harbor potentially dangerous bacteria. So keep it in the refrigerator or freezer. I am wondering where I can get organic Ruby Frills basil. I have looked all over the internet and cannot find purchasable seeds. Do you have any suggestions?